It is important for family historians to regularly analyze their work and plan the next research step before ever approaching the library. When it’s time to research, the plan should already be in place. Wandering through book stacks, library catalogs, or large websites is not an efficient way to find needed information. Write objectives (set goals), then plan the sources to be searched to meet your goal. An earlier blog post has been written about recording Searches in ResearchTies. With planning and recording searches in ResearchTies as part of your research process, you will never forget thoughts and ideas of where to look for additional evidence. When it’s time to begin a research session, generate your “to do” list. Use the ResearchTies search engine to retrieve planned searches for the repository where you will be working. All matching entries will be listed instantly—even if they were planned months or years ago. 1. From the home page, click on “Search Your Logs,” or click the magnifying glass in the blue toolbar. 4. Select any other desired variables to narrow the hits. For example, if a user wants to focus their work on one family, they can narrow to only that family as well. A list of Searches meeting the criteria will be returned. 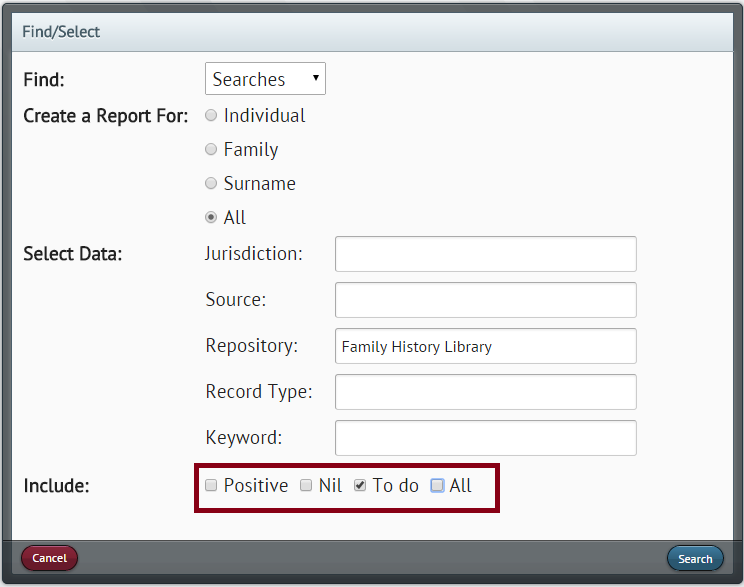 If planned searches have been fully recorded, this “to do” list will display the repository, call number, complete source citation, the scope planned for the search (who and what you’re looking for), and a link to “Add the Result.” While conducting research, access the source, search it, “Add the Results,” then save. The program will return to the “to do” list to choose the next planned item. This process will help you to be a very efficient researcher, and everything necessary to analyze the results will have been recorded in the program for future reference. In the process of planning searches, don’t neglect to study catalogs of distant repositories that might have relevant records for the research problem. Don’t ignore the existence of those sources only because it is not an archive or courthouse with easy access. If the opportunity ever presents itself to visit that repository, you will already have your plan in place. When it’s time, generating the list of potentially helpful items will take a matter of seconds. Every time results are analyzed, new objectives are written, or ideas come for new searches, data enter those plans and ideas. When it’s time for a session of research, whether it be online or at a library, archive, or courthouse, generate the “to do” list and work your plan. With the multi-variable search engine, it’s possible to create a list of broad or very focused “to do” items. Fewer search variables will return a broad list, more variables will narrow to a shorter list. Goal-setting sessions, planning sessions, research sessions, and analysis sessions are commonly used by professional researchers. Plan your next searches and generate your “to do” list today! ResearchTies announces the recent release of a new autofill feature for all dropdown boxes in the program. When users begin typing the desired entry, the autofill feature now highlights the first matching item in gray. Continue typing until the correct entry is highlighted, then use the tab key to autofill the item and move the cursor to the next field. This feature allows keyboard data entry without needing to use the mouse. For those who prefer the mouse, the process has not changed. Begin typing, and when you see the desired entry in the dropdown, click to select it. Either method can be used at any time. 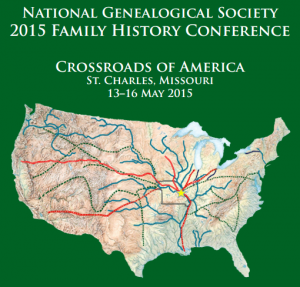 ResearchTies will be attending the National Genealogical Society Conference in St. Charles, Missouri, 13-16 May 2015. Learn more about the program by attending a class, “ResearchTies: Planning for Effective and Efficient Research” on Saturday morning, 16 May, at 9:30 AM. Or, visit with us in the vendor hall (booth #611). We look forward to seeing you there! 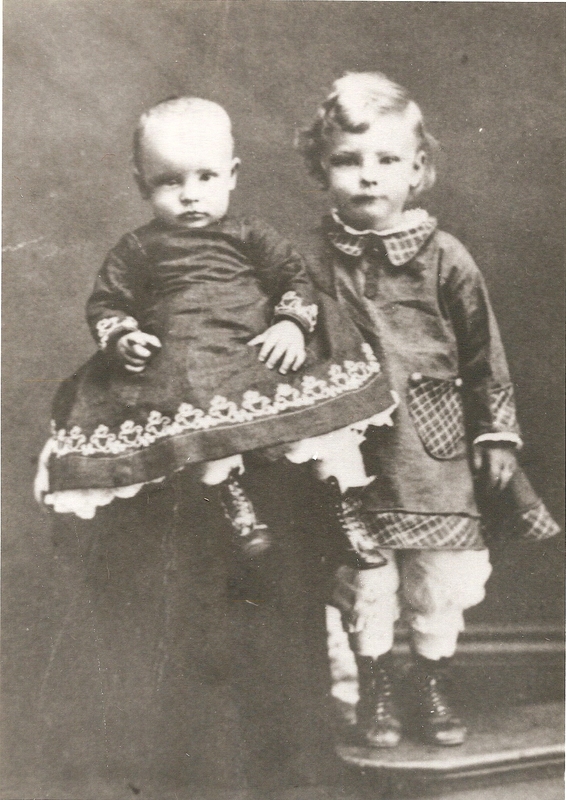 Genealogists gather documents of all kinds, including photographs. Sometimes the photos are documentation for life events (like photos of grave markers), but the largest portion of our photos are typically pictures of people we love. These photos need to be preserved. One of the most significant challenges in organizing photos is to figure out how to file them so that each image can be easily retrieved in the future. The difficulty of indexing and organizing photos is no different than that of filing our genealogical documents. Once you realize how similar these issues are, you understand that a tool like ResearchTies is the perfect solution for both. Indexing photos with ResearchTies provides organization, preservation, and instant retrieval—the same capacity applied to your documents. Using this program to index photos also means that they will be accessible from your online account at any time. It will be possible to share photos with relatives while attending a reunion or visiting in their homes. 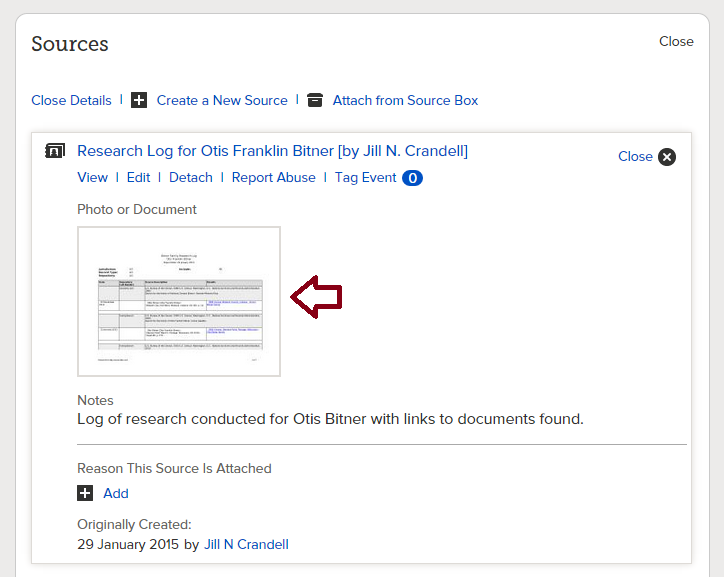 You can also create a PDF research log of the photos with active links to share with family members electronically. Learn to use and enjoy the high quality features of ResearchTies that are not found in any other research logging method. When conducting research, it’s relatively easy to determine a research goal, locate a repository, describe a source, and record the results. To index digital photos, transfer the same concepts to a photo collection. From the home page, click on “Add Information” or click the green add button in the blue toolbar. The place and people to record in the objective will depend on how specific you want to be. If you want one objective to cover all photos, create a place for “world” and a surname “all.” Otherwise, it is possible to specify families or surnames in combination with specific places. The source is the photo itself. Click on the green add button in the “Source Title” field to add a new photo. The repository of the photo is the person’s home or the archive where the photo is located. If needed, add a new repository. To add a repository, click on the green add button in the “Repository” field. Enter the name of the archive or the place where the photo is located. (For example, “Home of James Gardner”) Add any desired location and contact information for the repository. Click “Add Repository” and the program will return to the “Add Search” template. Be sure the repository was recorded, then select “photo” as the record type. The author is the name of the photographer, if known. Give the photo a descriptive title. If the photo is from an archive or other official repository, be sure to record the additional citation and collection details. If this is a personal photo, the fields can be left blank. If the photo is of an individual, the scope of the photo would be that person. Click “Individual” and select the correct person from the dropdown. If the photo is of several members of a family, the family could be selected. Otherwise, select the most relevant surname for the group in the photo. Finally, record the results of who is in the photo. Create a result for each person. The Result date is the date the photo was acquired. Select the first individual in the picture from the dropdown box. If there are names written on the photo, be sure to include the name as it was recorded on the picture. It’s likely that there won’t be any additional citation information, unless the image is from a formal archive collection. 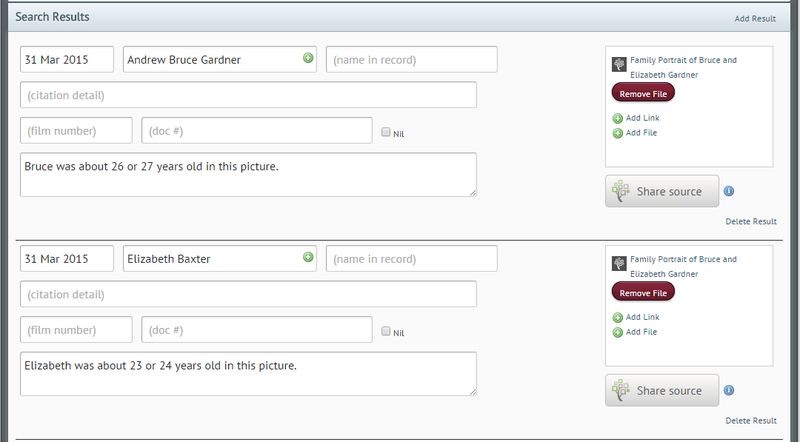 The comments field is the place to record information about each specific person in the photo. One example might be to include a person’s age. This comment field is also keyword searchable. To attach the digital file of the photo, click on “Add File.” Give a brief descriptive name for the photo in the “Description” field, then click on “Choose File” to attach the photo. If the photo is of more than one person, be sure to add a separate result for each person in the photo. 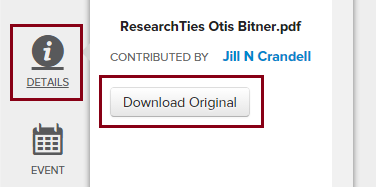 NOTE: The “Share Source” feature in ResearchTies currently shares image links with the “Source” area of FamilySearch Family Tree, not the “Memories” area. Until we are able to program the option to choose “Memories,” you’ll need to share photos with FamilySearch (if desired) while working in Family Tree. Once the photos are recorded in ResearchTies, retrieval is as easy as locating your research documents. From the home page, click on “Search Your Logs” (or the magnifying glass icon on the blue toolbar). To return a list of all objectives relevant to photo indexing, select “Photo” as the Record Type and click “Search.” Additional variables can be selected to narrow the list further, if multiple objectives have been written for photos. Select “Searches” in the dropdown box to locate entries at the Search level. For example, if you entered the name of a cemetery in the Search comment box, this would be the form to use to conduct a keyword search on the name of the cemetery. Including “Photo” as the Record Type, conduct a search by repository to return all photos from a particular archive or an individual’s collection. A search for a Jurisdiction along with the Record Type “Photo” will return all photos relevant to that place. A search for Results for a specific person and the Record Type “Photo” will return hits for all photos of that person, regardless of whether they are group or individual photos. When using the search engine for any of the three options (objectives, searches, or results), combinations of search terms can be used to further narrow the results returned. For example, it is possible to search for photos of the Andrew Bruce Gardner family of Afton, Wyoming, in my personal collection. Learn how to enter and use the different search variables to index and instantly retrieve any or all of your family photos. 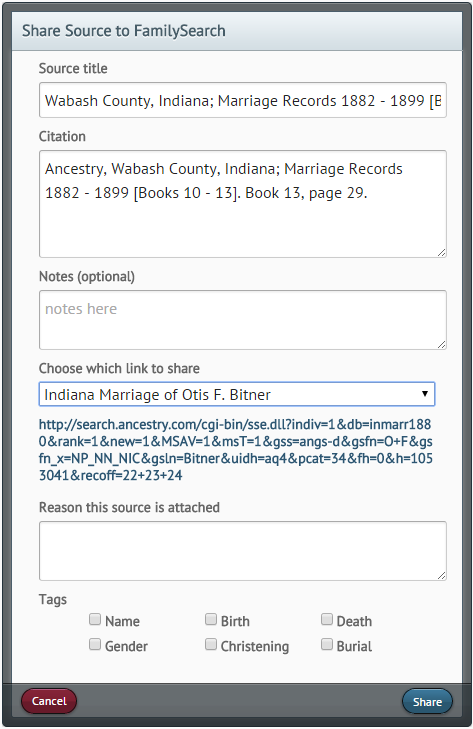 Share a Source from ResearchTies to FamilySearch Family Tree With Only a Few Clicks! When the results of research are recorded in ResearchTies, they can now be shared with FamilySearch Family Tree without any duplicate effort. All of the necessary information is already available in the log. When a Result is recorded, click the “Share source” button in the bottom-right corner of the form. A template will open with all of the FamilySearch required information autofilled in the form. Add the reason for attaching the source, click the desired tags, then click “Share.” It’s that easy! 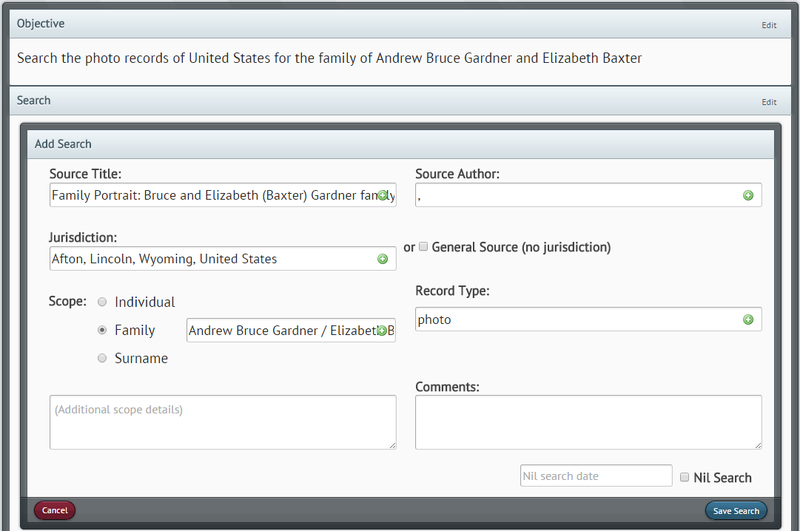 The source will be attached to the correct person in FamilySearch Family Tree with the citation and a hyperlink to the document. After sharing, the FamilySearch icon will change from gray to blue to help you remember what has already been shared. 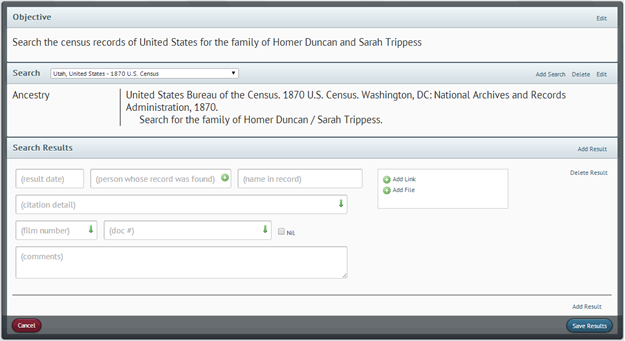 For all of our FamilySearch features, see the new slideshows in the Learning Center for step-by-step instructions. Enjoy! ResearchTies is now FamilySearch® Certified! In an earlier blog post, you can read an article about sharing a research log on FamilySearch Family Tree. 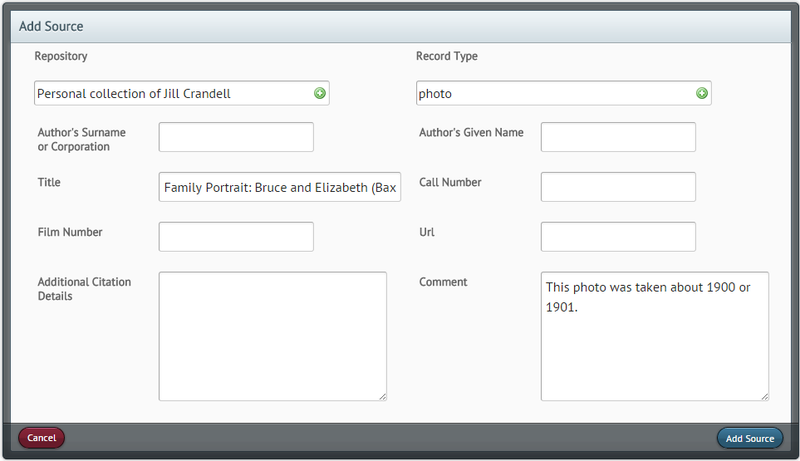 This month we are announcing new features that are certified to interact with the data in Family Tree. We are very excited to help all researchers share their research, while eliminating all of the duplicate data entry normally required to share records online. The ID number will be imported into ResearchTies. Save the form. With the ID number recorded, the “Share Source” feature will now be able to attach sources to the correct person in Family Tree. The evaluation and analysis of any genealogical conclusion rests on our ability to study a researcher’s citations and documents, as well as the extent of the research that has been conducted. If a work is still in progress, the conclusions are known to be tentative until a reasonably exhaustive search has been completed. We need to know which records have been found, and which searches have yielded no results at all. The entire file of documents needs to be available to study in order to analyze the data as a whole. Knowing this, professional genealogists and hobbyists alike are wary of current online trees. Most trees do not have any method to record a research log for sharing our full work with others. Yes, several sites allow researchers to add some sources and create links, but where can nil searches be recorded? The greatest weakness of online trees, and a significant reason they are not given more respect, is that there is no ability to see the genealogical conclusions in relation to the full context of research that has been conducted. ResearchTiesTM is excited to begin the process of addressing this weakness! It is now possible to attach a copy of your research log to FamilySearch Family Tree (or any other online tree that will allow a PDF document to be uploaded). For an example, go to the record of Otis Franklin Bitner (K8TZ-5TP) on FamilySearch.org. You will be required to login to the site, but if you don’t have a FamilySearch account, you can create one. It’s free. After logging in, scroll down the page to the “Sources” section and notice that the first link is a research log. Click on the name of the log, and an expanded window will open. Click on the image of the log, and you will be able to see it in a viewer. Hovering your mouse over the image will display zoom tools at the bottom of the image to enlarge it. If you prefer, click on “Details” to the right of the image. This will present the option to download the original. Whether the user is reading the log from the viewer or a downloaded copy, the hyperlinks to your research will be active. Anyone will be able to read the log and view all attached documents. This is an exciting way to be able to collaborate with others and share more than a few select sources. 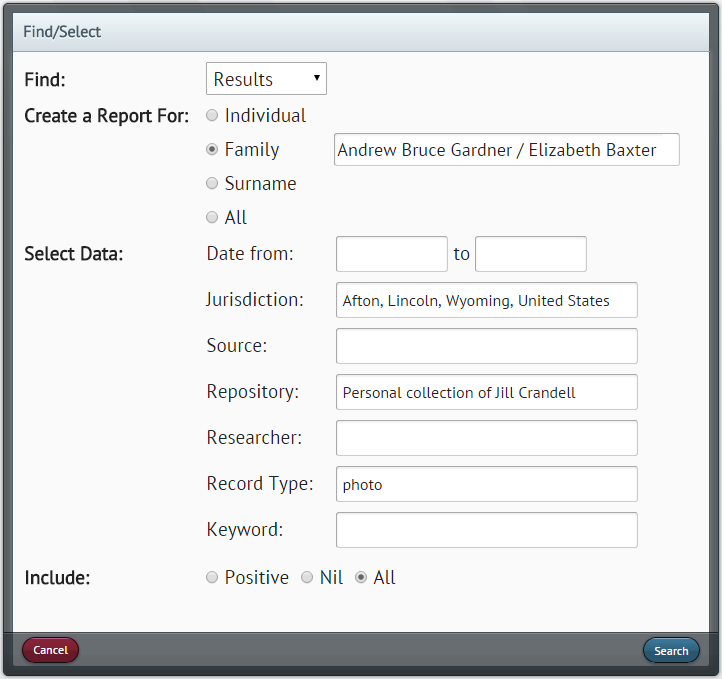 For step-by-step instructions on how to create and attach a research log to FamilySearch Family Tree, see the new slide show posted in the Learning Center at ResearchTies.com. Are you concerned that your research isn’t finished? No worries! Any source created on Family Tree can be edited at any time. Click on the source, then click edit. In the section where the log was uploaded, click edit again. You can then click “remove memory” to delete the current log, then “add a memory” to upload a new one. This way, you can always share a current log. Share your research today, and help others to realize the importance of keeping a research log. Let’s all work together to improve the quality of online trees. After formulating an objective and planning appropriate searches, it is time to conduct the research. While working through the research plan, it is important to record the findings in detail and as soon as possible. If it can be done at the repository while researching, that is ideal. In ResearchTies, use the search function to generate a “to do” list. (See New-user Instructions, p. 16) To the right of each item on the list is a link to add the result of that search. Clicking “Add Result” will bring you to a template similar to the following. Notice that the objective is shown at the top of the form, the Search being conducted is next, and the third section of the form is the “results” template. Be sure to record a Result for each person located in the search. Recording a result involves selecting, adding, or typing the appropriate data in each field of the template. Result date – Record the date of the Search. Past dates can be entered when recording previous research, but it is best to record your work as it is done. Using the tab key will record “today’s date” without the need to type it. Otherwise, type the desired date or select it with the calendar tool. Person found – Select from this dropdown the person who was found in the Search. Type a few letters to narrow the list, and click on the entry when it is shown. If the person is not yet in the list, click on the green add circle and add the person. Name in record – Type the spelling of the person’s name exactly as it was found in the record. It is important to track the various spellings, names, and nicknames used by each person. Citation detail – The bibliographic information for the source being searched was already added to the source template when creating a research plan. The citation detail field on the Results template is for recording the additional details needed beyond the bibliography to create a footnote. The researcher needs to know exactly where the information was found for the specific person being recorded. For a book, this would be a page number. For a census, it’s necessary to record the town, county, state, ED, page, sheet, etc. The source being searched will determine the amount and type of detail to record. Film number – When using a source that continues for two or more microfilms, record the film number that applies to this specific person. If the source is contained on a single microfilm, the film number should be recorded in the Source List to avoid the need to add the same film number to every Result separately. Document number – This field may be used for paper filing numbers, or you may record the folders and file name for an electronic file on your computer hard drive. 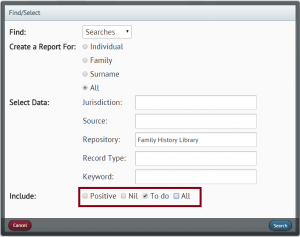 Nil – When a search for a specific person is Nil, use the Results template to record the person and check the box that the search was Nil for that person. This is best used when there are mixed results in the search. Remember, when the entire scope of the search was Nil, record the date and check the box on the Search template. However, if you find a few members of a family but not everyone you had hoped to find, record those who were located and then make an entry for those persons you had also hoped to find but did not. This will help you analyze not only what you have found, but also what you have not found. Comments – Record any comments or information about the results of the search. Add Link – Click on “Add Link” when you would like to record the URL for an online result. Two fields will open. The “description” field is the place to record what you want to name the result. These are the words that will show as a hyperlink in your reports, rather than a long URL of jibberish. Copy and paste the URL from the address bar of your browser into the “Link” field. When using this function, it is important to remember that URLs will change over time, and URLs to subscription databases do not allow others to view the documents if they don’t have a subscription. Consider the “Add Link” function to be temporary. More than one link may be recorded. To add more, click on “Add Link” to open more fields. Add File – We highly recommend that users download a copy of an online result or save it as a screenshot to your hard drive. Any digital file may then be loaded as the Result of a Search (.jpg, .pdf, .png, .docx, .xlsx, etc). These files may be images, photos, translations, transcriptions, research analysis and conclusions, and more. Click on “Add file,” then record a name for the file in the “description” field. Click on “Choose file,” then select the file from the directory of your hard drive. Multiple files can be added to each Result, if desired, and they may be added in combination with links. When the Result is saved, a copy of the file is placed on the ResearchTies server. The hyperlink is linked to the file on the server, so if you ever rename or move the files on your hard drive, the link will not break. This is also beneficial for preservation of your files. If your hard drive ever crashes, all of your documents will still be preserved on the ResearchTies servers. Add Result – If more than one person was found during the Search, click on “Add Result” to continue adding more Results, as needed. “Ditto down” arrow – Notice that several fields on this form have “ditto down” arrows. Clicking the arrow will copy the information recorded in the same field of the preceding entry. If more than one Result is recorded for a Search, clicking the “ditto down” arrows eliminates the need to retype data that is the same for all members of the family. By accurately and consistently recording your research results, you will be able to quickly retrieve your documents and facilitate higher quality analysis. Last month, the Gedcom import process for ResearchTies was improved. It was discovered that blank marriage dates in the Gedcom file were filling in “today’s” date during the import process. We apologize for the inconvenience and are happy to announce that the bug has been fixed. If you become aware of any other Gedcom issues, please send feedback. We are happy to continue improving the program for all of our users.